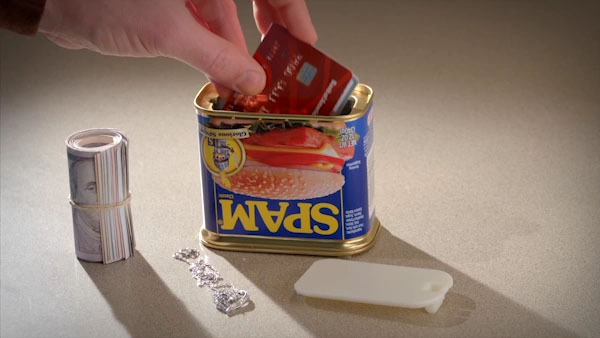 Can Safes: Decoy containers cleverly disguised as popular canned goods. There are a lot of places you can keep a safe: behind a painting, on the other side of a rotating bookcase, or in the middle of a laser grid. But how about right on the counter in broad daylight? Decoy Can Safes substitute high-tech and hefty for clever and compact. The design takes advantage of the main deterrent for thieves: time. During a crime, burglars need to move as quickly as possible to avoid being caught. Without time to inspect each mundane item, a well-designed decoy can be just as effective as a state-of-the-art security system. After all, they can’t steal what they can’t find. Turn your pantry into a vault. Decoy Can Safes complete their convincing illusion with meticulous attention to detail down to the exact dimensions of their namesake cans. The officially-licensed labels on those cans aren’t just imitations of the famous Campbell’s and Spam designs; they’re the exact same ones. So unless your would-be-burglar decides to fix themselves dinner, they won’t know that your valuables are right under their nose. Shroud your money in normalcy. If you need somewhere to store your priceless art collection, invest in a vault. 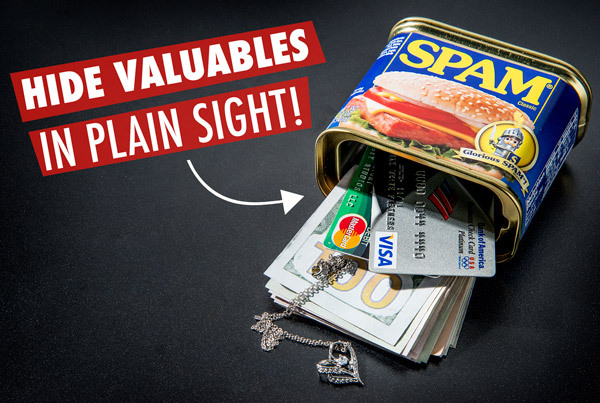 If you need somewhere to stash your emergency cash, jewelry, and other small valuables, get a Can Safe. These stealth containers are a practical way to hide your precious possessions. They’re much less obvious than a nightstand drawer and less messy than digging a hole in your backyard. It has valuable storage space. 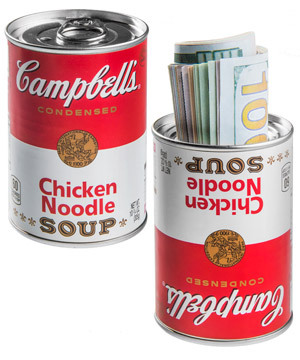 Decoy Can Safes are available in both Spam and Campbell’s Chicken Noodle Soup. 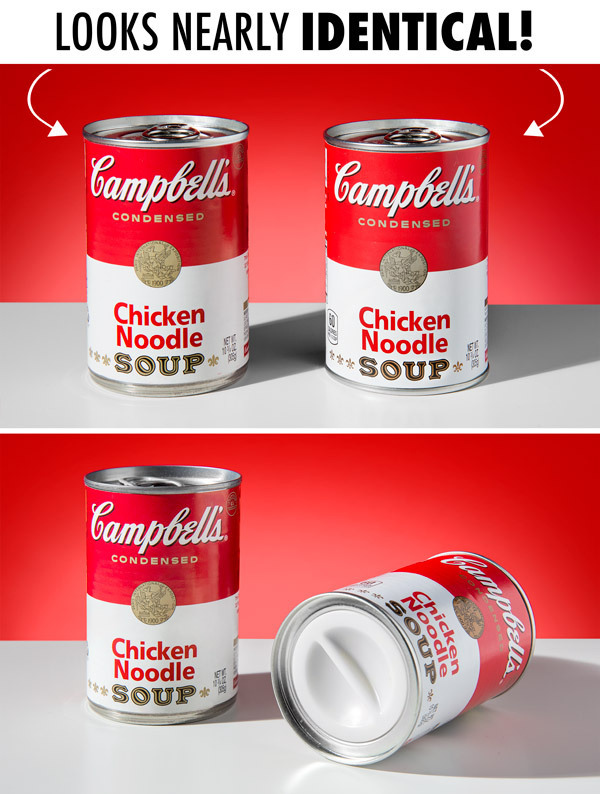 The two styles provide slightly different shapes of storage inside the empty cans. Both disguises camouflage perfectly into your kitchen so as to be indistinguishable from your real food. The boring exterior provides great security; it’s like enrolling your valuables in the witness protection program. 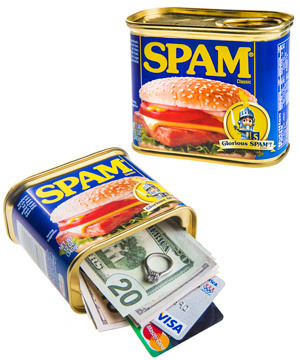 It’s the kind of spam you’ll want to keep. Question: How are these different from Hyper-Realistic Can Safes? Answer: Both products use the same concept to hide your valuables. The main difference is that Decoy Can Safes have a plastic bottom while Hyper-Realistic Can Safes have a metal bottom. Question: How are the trap doors attached? 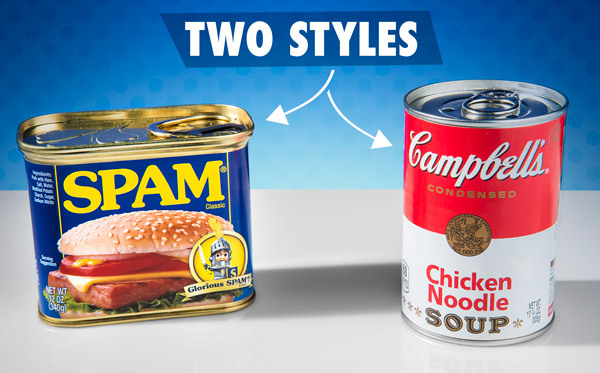 Answer: The Campbell’s style has a screw-on bottom. The Spam style has a latch-on door.